Please make sure you disconnect the Unit from the mains power, before beginning any work on the Unit. For ESD reasons avoid touching any components or plated areas or wear an ESD strap. On the housing one can read "Warranty void if opened", so do at your own risk. Remove the 3 rotary dial knobs and the level knob from the top panel by pulling them straight up. Take the Phillips screwdriver an unscrew the 4 screws on the 2 MIDI sockets. Unscrew and remove the 18 nuts from the jack sockets. Turn the unit upside down and place it on a soft surface. 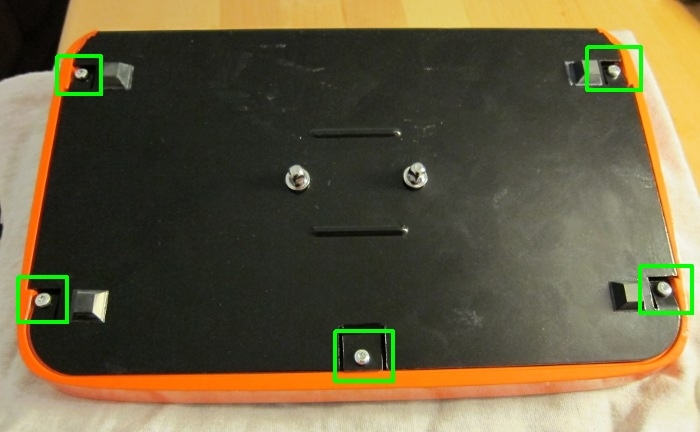 Unscrew the 5 Torx screws holding the lower lid to the upper orange lid. Gently lift up the front edge of the lower lid and move it down slightly and then backwards to release it from the jack sockets. 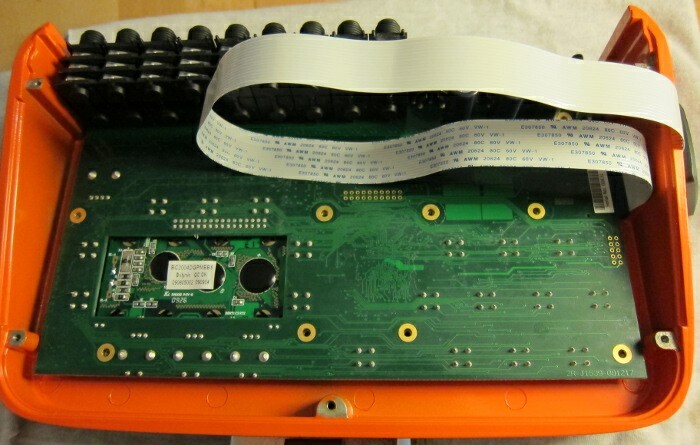 Remove the bottom lid and you will now see the circuit board. Avoid touching any components or plated areas. 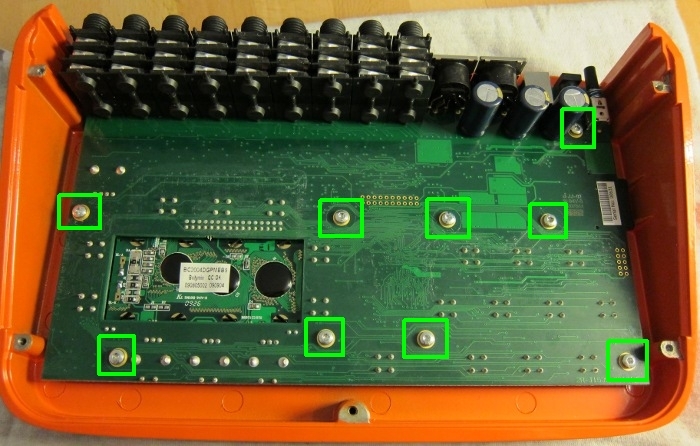 Remove the 9 screws holding the circuit board to the upper lid. Lift up the circuit board by holding it at the jack sockets and the edges. Locate the SD-card slot holder on the left hand side. To remove the SD card, ease it out gently from the holder. Now insert your SD-Card-Extender. WARNING: Be careful to run the flat cable straight out of the module as pictured. If the cable placement is too close to the module corner the cable will be pinched/creased and rendered useless. When placed correctly there is ample room for the cable to slide freely between the module casing and the bottom cover plate. Insert the circuit board back in to position and very gently screw the 9 screws back in to place. There is no need to over tighten the screws. As soon as the screw meets the circuit boards surface you are fine. With the orange lid still upside down, take the lower lid and angle it in to the small recess underneath the jack sockets. Gently pull the front edge towards you and then down to meet the front of the orange metal work, making sure the holes on the lower lid slide over the jack sockets. Gently screw the 5 torx screws back in to position. Again taking care not to over tighten them. Screw all 18 jack socket nuts back on the jack sockets. Screw the 4 MIDI screws back in to place. Turn the unit up again and replace the 3 rotary dial knobs and the level knob. Be aware of the flat marker area inside the knob matching the detent on the shaft. You can use double sided tape to fix card reader on the housing. Insert SD-Card to card reader and test the unit. If everything is okay the unit boots up as normal. If you put in a card with more than 4GB it might take a few seconds more to boot up. To prepare other SD-Cards simply copy operating system, settings-file and sounds from you old card. Thanks for taking your time doing this, much appreciated! 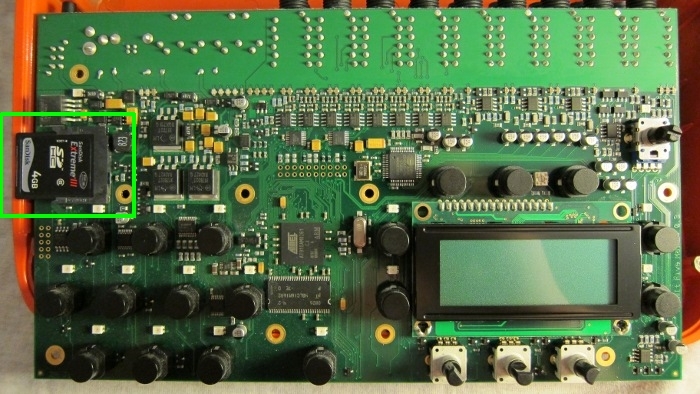 I think that I will upgrade my module too. congrats you did exactly what i did!!! Great! 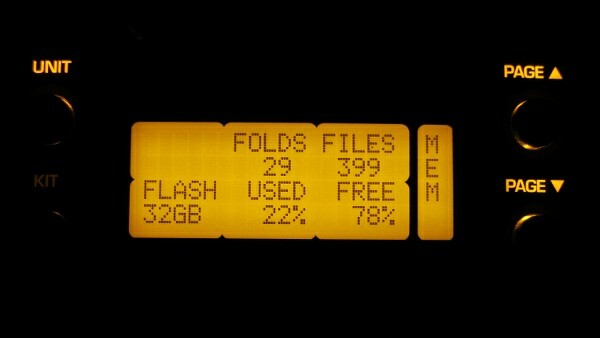 Where do you get the SD card extender from? Yes, the extenders are not easy to find and finally i got mine from Jman. In my opinion it is really convenient just to take out the SD-Card and put it in the PC to change/add sounds and playalong songs. And data transfer is much faster since you don't have the USB bottleneck. This is not true, you can buy them in amounts as small as 1 from Best Buy digital, and they usually have plenty stock. I bought a single cable from them and it is the proper spring loaded connection, works a treat. Not sure if they still have stock but worth a try and very cheap. You can't at the moment. When you bought it it was one of those rare occasions when you can find one on Ebay. The seller you linked to doesn't ship to most of the world. They are hard to find and mostly you have to buy 20 or more pieces. 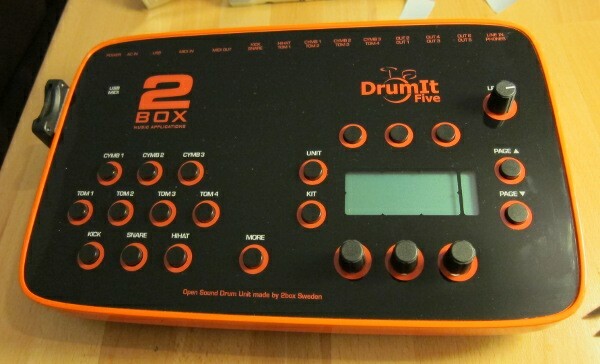 On rare occasions you can find one on eBay. Was just pointing out that they are available on e-bay, you do not have to buy 20 pieces, and they aren't hard to find in all countries, some of us are just lucky I guess. Australia, Belgium, Canada, Denmark, Finland, France, Ireland, Japan, Malta, The Netherlands, New Zealand, Norway, Poland, Portugal, SIngapore, Spain, Sweden, Switzerland, Turkey and The United Kindom. Thanks! I always try to be either funny or helpful. Good to know that my posts were helpful, because all I said in my original post was spot on. P.S. bestbuy digital sold the last extension cable in April. You can't buy one at the moment. Maybe in a couple of weeks or months they will again be available at bestbuy digital or some other seller, but right now it's either Jman or at least 20. Manfred, thanks for the detailed walk-through. I was going to include an article on how to do the mod in digitalDrummer, but you've done such a great job, there wouldn't be much point! Was it the same for you ?